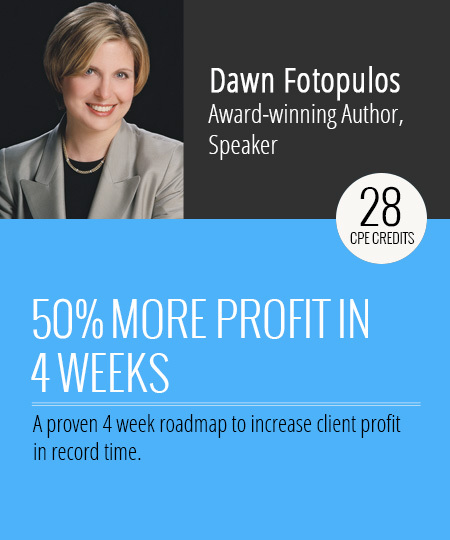 Proven courses for accounting professionals to grow your clients' profits in record time. Business thrives when profits are healthy and predictable. What if most businesses are failing because the owners are doubling down on wrong assumptions? What if we could turn millions of businesses around in a matter of weeks or months? We can. This course provides the step by step guide. This course is designed for accounting professionals. This was originally given at Intuit's Connect conference in Silicon Valley. Find new, profitable revenues where it's already been found; your existing client base. This course shows you how. This course was presented at Scaling New Heights. Tired of your clients not taking your great advice? This course will show you how to bridge the gap and enter into your most important role as their business adviser. The Hidden Profit Roadmap, presented in this course, is a very efficient way to double or triple profitability for any service or product business in record time. It was presented at Scaling New Heights to rave reviews. This course was presented to accounting professionals and business owners at Intuit's Connect Conference. It will show you how your clients can and must change their mindset about their financial statements. It also reveals the true identity and value accounting professionals offer to business owners. Get paid based on what you deliver, not just what you do. Expand your accounting practice and increase your profitability by finding hidden profits for your clients. Become a trusted business strategist, not just a tax preparer. Our unique program will show you how to partner with your business clients so they can gain the full benefits from your knowledge and analysis – without any hard selling. You’ll learn the three key areas of business profitability, and how to build an action plan to unlock those profits for your clients in record time. Our course will teach you to be able to empower your small business owners to understand their financials and value your critical contribution to their bottom line. Increase your profitability or expand your accounting practice by finding hidden profits for you or your clients.